From pre-kindergarten to old age, Downtown Doral is now planning to offer options for people of all ages. Codina Partners is bringing assisted and senior living to the mixed-use, master-planned community in two deals, the first with apartment developer Greystar. The Charleston, South Carolina-based firm recently paid $14 million for the 2-acre site, a piece of the White Course, from Lennar Corp. and Codina. Greystar will build Overture Downtown Doral South, a roughly 200-unit apartment complex for residents 55 and older, Codina said. He also has a letter of intent to sell a similarly sized piece of land to an unnamed assisted living developer and operator to build an assisted living facility at Downtown Doral. The projects are part of phase two of the community, which will also include a Baptist Health South Florida Express Care location and a school for grades six through 12. Baptist signed a 15-year lease for about 4,200 square feet and is expected to open at the shops before the end of this year. In 2016, Codina Partners — with Jim Carr’s CC Homes — and Stuart Miller’s Lennar Corp. won the bid for the White Course in Doral, paying a total of about $96 million to acquire the golf course. Lennar and Codina split the property, which is adjacent to Downtown Doral, in half. When it’s completed, Downtown Doral will have more than 1 million square feet of commercial space, 400,000 square feet of Class A office space and 5,000 residential units. The master-planned community will include a city hall, a charter school and Publix that are already open, town homes, single-family homes and condo towers. 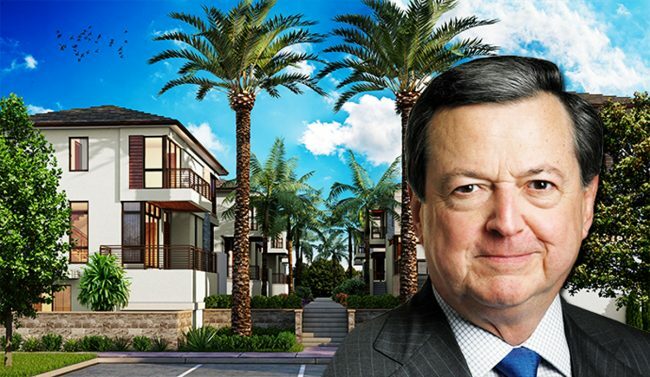 Codina-Carr Homes has sold about 50 homes at Canarias, a community of 343 single-family homes and 52 townhouses next to Downtown Doral, and is planning to deliver the first houses by June, Codina said.